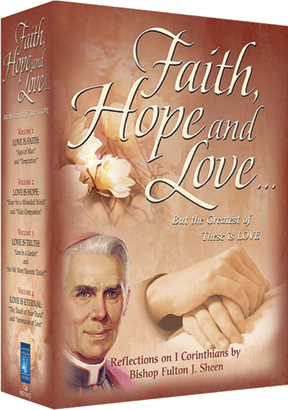 Faith, Hope and Love With Fulton Sheen – Set of Four -- Bishop Fulton J. Sheen is eloquence at its very best. In this DVD collection, Sheen speaks about our pilgrimage of faith, hope and love, and how it leads to a harmony with the Lord. God is watching, loving, and caring for all of us, but we should never take for granted the hand of judgment. This boxed set includes four 55-minute volumes, each with two messages. In color and B&W. Vol. 1 - Love Is Faith: "Ages of Man" and "Temptation"
Vol. 2 - Love Is Hope: "Hope for a Wounded World" and "False Compassion"
Vol. 3 - Love Is Truth: "Love Is a Garden" and "Are We More Neurotic Today?" Vol. 4 - Love Is Eternal: "The Touch of Your Hand" and "Intimacies of Love"
A Man For All Seasons -- Each volume, narrated by Cameron Mitchel and Joe Campanella, includes three half-hour shows with timely graphics and breathtaking scenery. Spring -- 1. Gloom, Laughter, and Humor (St. Patrick's Day) — man has become preoccupied with gloom and has lost the ability to laugh at himself. 2. Love is a Many Splendored Thing (Mother's Day) — dramatic readings. 3. The Kiss that Blistered (Easter) — the kiss of Judas and the betrayal are compared to the seduction of Communism. Summer -- 1. Quo Vadis America (Fourth of July) — patriotism and America. 2. The Meaning of Love (Father's Day) — rules for loving are discussed. 3. Caring (Labor Day) — the true meaning of caring. Autumn -- 1. Stop the World, I Want to Get On (Columbus Day) — how our daily activities can become more meaningful to us and to those around us. 2. Loneliness (Thanksgiving) — the causes and cures of loneliness. 3. Go, Go, Come, Come (Veterans Day) — the world has two types of people: those who "go" to serves and those who "retreat" to prepare. Sheen discusses how this concept relates to four modern saints. Winter -- 1. Superman and Christmas (Christmas) — a unique comparison of fantasy and truth. 2. Happiness is a Rainbow (Valentine’s Day) — Tears are like prisms composed of drops of water that creates rainbows when light strikes them. This rainbow is the key to our happiness. 3. Glory of Being an American (President's Day) — The Bishop talks about three major glories of being an American. His Last Words: Fulton J. Sheen -- On Good Friday, 1979, a television crew visited St. Agnes Church in New York to tape a news piece. They were so enthralled by the speaker, Bishop Fulton J. Sheen, they taped his entire talk. This long lost tape has now been found and digitally remastered. It is titled "His Last Words." Bishop Sheen died later that year. This is the Bishop at his best: in a pulpit, not a TV studio. It is a new Sheen experience seen here for the first time. The Bishop's wit and wisdom transcend the years. His words remain a masterpiece of sacred prose and poetry. For today's troubled church, Bishop Sheen is a friend many are seeking to help guide their spiritual journey. With him, we see each sunrise as God's radiant promise that life is worth living. "God love you." Bishop Fulton J Sheen: Timeless Wisdom For Those Coping With Alcoholism -- Alcoholism destroys lives and injures families. Fortunately there is hope! 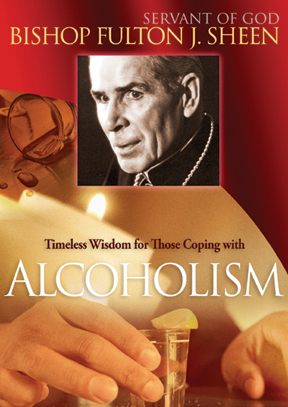 The time-tested wisdom and compassion of Bishop Fulton J. Sheen for those coping with alcoholism has been gathered in this special three-part collection of messages. Here Bishop Sheen offers solutions. The devastation and hurt can give way to healing through the Lord Jesus. Troubled lives can find peace. Sheen offers hope that alcoholism can be addressed if one reaches out for help from God as well as from family and friends. Sheen shows that one must be willing and search, but that once the Divine is introduced, we come to see how so often "God is the God of a second chance." Three 27-minute segments, color and B&W. 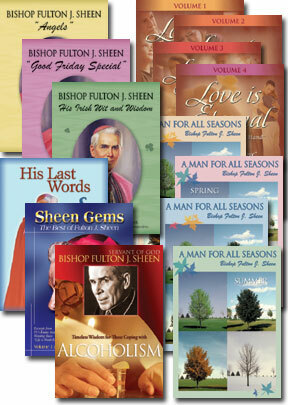 Sheen Gems: The Best Of Fulton J. Sheen -- Here are excerpts re-mastered from many of Fulton J. Sheen’s Emmy Award Winning Television Programs titled, "Life is Worth Living." Sheen's presence and sense of drama have crossed time and distance. His words of wit and wisdom transcend the years. His eloquence portrays the sacred truth that in every human heart there is a struggle known only to the soul and God. Two volumes on one DVD, color and B&W. Fulton J. Sheen: Angels -- Angels have existed from the beginning of time as God's messengers, God's helpers. Today people are rediscovering the existence of Angels and the wonderful work they perform on God’s behalf. The existence of the work of Angels required no revelation to Bishop Fulton J. Sheen, who enjoyed a special prayer relationship with God's spiritual beings. Here is Bishop Sheen's classic television program on Angels and the meaningful role they play in our world Included are two bonus programs from the classic Life is Worth Living series: Touch of Your Hand and Caring. Color and B&W. 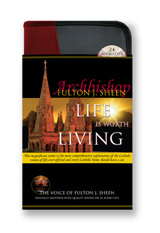 Best DVD on Bishop Sheen ever made. These are the best film footages Bishop Sheen. 6 hours long, 12 talks of Bishop Sheen to large audience. The time-tested wisdom and compassion of Bishop Fulton J. Sheen for those coping with alcoholism has been gathered in this special three-part collection of messages. Here Bishop Sheen offers solutions. The devastation and hurt can give way to healing through the Lord Jesus. Troubled lives can find peace. Sheen offers hope that alcoholism can be addressed if one reaches out for help from God as well as from family and friends. Sheen shows that one must be willing and search, but that once the Divine is introduced, we come to see how so often "God is the God of a second chance." Bishop Fulton J. Sheen is eloquence at its very best. In this dvd collection, Sheen speaks about our pilgrimage of faith, hope and love, and how it leads to a harmony with the Lord. God is watching, loving, and caring for all of us, but we should never take for granted the hand of judgment. This boxed set includes four 55-minute volumes, each with two messages. In color and B&W. Vol. 1 - Love Is Faith : "Ages of Man" and "Temptation" Vol. 2 - Love Is Hope : "Hope for a Wounded World" and "False Compassion" Vol. 3 - Love Is Truth : "Love Is a Garden" and "Are We More Neurotic Today?" Vol. 4 - Love Is Eternal : "The Touch of Your Hand" and "Intimacies of Love"
People of all faiths recognize Bishop Fulton J. Sheen as one of the greatest communicators of the twentieth century. He was born in El Paso, Illinois on May 8, 1895. As a young boy, he knew he wanted to be a priest. He was educated at Saint Viator College where he learned the skills he would use throughout his life. He was ordained in 1919 and went on to become one of the best known and greatly loved priests in modern times. He wrote 96 books and hundreds of articles and columns. He broadcast numerous radio and television programs. People of all faiths watched him on television because he spoke to everyone. They always waited with joy for his goodbye, his blessing "God Love You." In October of 1979, Pope John Paul II said to Bishop Sheen, "You have written and spoken well of the Lord Jesus. You are a loyal son of the Church." Bishop Sheen died on December 9 of that same year. The Vatican has opened the canonization cause for Bishop Fulton J. Sheen. He is now titled "Servant of God.". On Good Friday, 1979, a television crew visited St. Agnes Church in New York to tape a news piece. They were so enthralled by the speaker, Bishop Fulton J. Sheen, they taped his entire talk. This long lost tape has now been found and digitally re-mastered. It is titled "His Last Words." Bishop Sheen died later that year. This is the Bishop at his best: in a pulpit, not a TV studio. It is a new Sheen experience seen here for the first time. The Bishop's wit and wisdom transcend the years. His words remain a masterpiece of sacred prose and poetry. "It is not a unity of religion we seek but a union of religious people. We may not be able to meet in the same pew, but we can meet together on our knees as Christians." Rev. Billy Graham said of Sheen, "I greatly admired his ministry and his focus on Christ." Dr. Robert Schuller of the Crystal Cathedral wrote, "He was the first teacher from whom we all learned." Actor Martin Sheen chose his name from Bishop Sheen. The Holy Father used his tapes to practice English. The Bishop wrote 95 books and countless newspaper and magazine articles. He was an Emmy winner for his television program, "Life is Worth Living." For today's troubled church, Bishop Sheen is a friend many are seeking to help guide their spiritual journey. With him, we see each sunrise as God's radiant promise that life is worth living. "God love you." Fulton J. Sheen is eloquence at it's very best. In this superb and timeless message, Bishop Sheen's words ring with answers for today's realities and changing world. They offer inspiring guidance, encouragement, peace of mind, philosophical daylight called "common sense," and spiritual comfort that touches every heart. As a master storyteller, he subtly connects events to life allowing our private vision to grasp new realities that rise up from old doubts and fears. Bishop Sheen was a first in television, a triumph of spirit over limitations. He was an author, columnist, editor, orator and a world citizen of peace. Bishop Sheen's Irish heritage was evident in many of his television programs as he shared the wit and the wisdom he inherited from his Emerald Isle ancestors. In "Psychology of the Irish," Bishop Sheen offers his thougts on what makes a person Irish. Is it ethical? Environmental? Or wishful thinking on the part of those who are not Irish? God has a sense of humor, at least in Bishop Sheen's mind, and he explores that sense ofhumor in "The Divine Sense of Humor,"
"Why Do People Laugh?" is Bishop Sheen's take on humor. And, judging from the sense of humor he displayed thoughout his lifetime and on his television programs, he was an expert on the subject. Three 30-minute programs on one DVD. Angels have existed from the beginning of time as God's messengers, God's helpers. Today people are rediscovering the existence of Angels and the wonderful work they perform on God's behalf. Also included are two bonus programs from the classic "Life is Worth Living" series: "Touch of Your Hand" and "Caring." These are " Sheen Gems" - Exerpts remastered from many of Fulton J. Sheen's Emmy Award Winning Television Programs titled, "Life is Worth Living." Sheen's presence and sense of drama have crossed time and distance. His words of wit and wisdom transcend the years. His eloquence portrays the sacred truth that in every human heart there is a struggle known only to the soul and God. Actor Martin Sheen chose his name from Bishop Sheen. Pope John Paul II used Sheen's tapes to practice English. Dr. Robert Schuller writes, "he was the first Evangelist from whom we all learned." Rev. Billy Graham calls Sheen "the greatest communicator of the 20th century." "We may not be able to meet in the same pew but we can all meet together on our knees in prayer." The Vatican's Congregation for the Causes of Saints has approved the Petition from the Diocese of Peoria to open the canonization Cause for Fulton John Sheen. "Christ is longing to change your life in ways more wondrous than your dreams can imagine." "Bye Now and God Love You." Two volumes on one DVD. People today are looking for a voice of reason, of understanding, of calm. Our fears and anxiety of the future cause us to look for someone to give us guidance and assurance that we will make it through what lies ahead. In the 1950s and 60s, we had such a voice. We had a man who spoke to millions of people each week. He came into our homes through television. He not only spoke to the masses, he sppoke for the masses. That man was Bishop Fulton J. Sheen. He addressed the timeless issues of adolesence, kindness, friendship and love. His compassion and strength helped his messages endure the test of time. This volume, narrated by Cameron Mitchel and Joe Campanella, includes three half-hour shows from Bishop Sheen's "Life is Worth Living" series. Each program is themed to correspond with a major holiday of the season and includes timely graphics and breathtaking scenery. 1. Gloom, Laughter, and Humor (St. Patrick's Day) - man has become preoccupied with gloom and has lost the ability to laugh at himself. 2. Love is a Many Splendored Thing (Mother's Day) - dramatic readings. 3. The Kiss that Blistered (Easter) - the kiss of Judas and the betrayal are compared to the seduction of Communism. 1. Quo Vadis America (Fourth of July) - patriotism and America. 2. The Meaning of Love (Father's Day) - rules for loving are discussed. 3. Caring (Labor Day) - the true meaning of caring. 1. Stop the World, I Want to Get On (Columbus Day) - how our daily activities can become more meaningful to us and to those around us. 2. Loneliness (Thanksgiving) - the causes and cures of loneliness. 3. Go, Go, Come, Come (Veterans Day) - the world has two types of people: those who "go" to serves and those who "retreat" to prepare. Sheen discusses how this concept relates to four modern saints. 1. Superman and Christmas (Christmas) - a unique comparison of fantasy and truth. 2. Happiness is a Rainbow (Valentine's Day) - Tears are like prisms composed of drops of water that creates rainbows when light strikes them. This rainbow is the key to our happiness. 3. Glory of Being an American (President's Day) - The Bishop talks about three major glories of being an American. Bishop Sheen was someone who not only had a rock-solid theological background, but he also had the ability to relate concepts with great insight and wit that appealed to everyone, from the theological scholar to the uneducated and the non-Catholic. Perhaps, that’s why his words are still fresh and inspiring today, and continue to change the lives of thousands! This magnificent series is the most comprehensive explanation of the Catholic vision of life ever offered and every Catholic home in America should have a set. 3:6. And the word came to the king of Ninive: and he rose up out of his throne, and cast away his robe from him, and was clothed in sackcloth, and sat in ashes.